Sadly, this article (a) misrepresents the Biblical creation position; (b) contains incorrect science; (c) teaches incorrect theology (d) gives false assurance, because many do ‘go the wrong way’ precisely because of such teaching. Fathers, our children are beings who are going to live forever in heaven or hell! What a responsibility we have to ensure we teach them God’ principles —not man’ opinions. One of the things I noticed about this article was that not one Bible passage was quoted. Only one Bible verse was referred to (2 Peter 3:8), and it was used incorrectly to try to justify that the days of creation were not ordinary days. However, this article did quote many people. But remember, all of us have feet of clay. It’ interesting to read what other human beings have to say—but ultimately we are all sinful and fallible, and it’ what God’ Word says that matters—regardless of our opinion and how qualified we are! The author calls those who believe as we do in six literal days, global Flood etc., ‘strict creationists.’ This phrase in itself seems to imply a narrowness or legalism and comes across as off–putting to the reader. However, those Christians who believe in evolution are called ‘Christian evolutionists’. This of course sounds much more attractive. ‘Strict creationists, who believe in a literal six–day creation, have a tougher time answering this question’. The more than 300,000 fathers who read this article would get the idea that the ‘Christian evolutionists’ have the correct answers. This is nonsense. Anyone with a basic knowledge of science knows that a baby develops from the information that is already present in the sperm and egg cells. This has absolutely nothing to do with evolution, which requires new information to be generated. The methodology of teaching given in this article is that fathers should teach their children different views regarding Genesis, and let them make up their own minds. ‘Train up a child in the way he should go: and when he is old, he will not depart from it’. Now this is not a guarantee that every child will become a Christian, for as Scripture teaches over and over again, each must answer for his own sin. However, it is a promise that how you train your children will affect them for the rest of their life. (The original can also read ‘it will not depart from him’). The word ‘train’ is of particular interest here. It is related to the word for palate—the palate in your mouth. When the Hebrew mothers would ‘train’ their children to eat new foods when weaning them for instance, they would put food in the child’ mouth so that it touched the child’ palate and the child would learn to taste this new food. The child then really has no option but to swallow the food. As the mother continues to ‘train’ in this way, the child acquires a taste for this new substance. A practical example of this is seen in the fact that Australians love Vegemite®, a black paste made of yeast extract and salt. The average Aussie likes nothing better than to have Vegemite® on toast with breakfast. However, most Americans, when given Vegemite® on toast, can’t dive fast enough for some water to get rid of what to them tastes horrible. Now why do Australians love Vegemite® and Americans can’t stand the taste of it? The reason is that when babies are very young in Australia, mothers start to feed them Vegemite® so they learn to acquire a taste for this ‘delicacy’ at a young age. Australians then grow up loving Vegemite® for the rest of their lives. Americans, however, don’t get to taste Vegemite® until an Australian suggests they try it. Because they have never acquired a taste for it, they can’t stand it, and so will have nothing to do with it for the rest of their lives. What then can we learn from this, concerning the spiritual training of our children? Well, we need ‘Vegemite® Kids’—children who are taught from when they are born to acquire a taste for spiritual things. ‘That we henceforth be no more children, tossed to and fro, and carried about with every wind of doctrine, by the sleight of men, and cunning craftiness, whereby they lie in wait to deceive’. When our first child was born, he didn’t look up at me and say ‘Hi Dad! What’ your view of eschatology and soteriology?’ and so on. He would have some light available to his mind and conscience all through his life, as Paul indicates in Romans 1:19–20, (the witness of creation) and Romans 2:14–15, but our job as parents was to train him in that which is truth, so he could distinguish good from evil (Hebrews 5:14), know what he should believe, be able to defend his faith (1 Peter 3:15), and not be ‘tossed to and fro by’ every wind of doctrine. Yes it’ true that our children need to ‘ ... know Jesus died for them and loves them and that there is a heaven ... ‘,5 but, if they don’t understand about original sin (committed in a literal garden), and that death entered the world because of sin (which is why Jesus died on a cross), and that all doctrine is ultimately founded in Genesis—then when they are taught they can believe in evolution and its millions of years of death and struggle, and that man evolved from animals (in other words that Genesis is wrong), there will be no logical foundation for the doctrines of Christianity in their lives. When children are not taught to acquire a taste for the truth, and are brought up as this New Man article (however well-intentioned) directs, to be given all views and choose whichever they think best, (with a bias toward believing in evolution), they will, sadly, be overwhelmingly likely to be the casualties. An increasing number of young people who are brought up in the church eventually reject the Christian faith. In one higher educational institution, a poll showed that 80 per cent of the students believed in God when they went in, but this reduced to 16 per cent at the end of the first year, as the effects of evolutionary teaching ‘hit home’. Those taught logical reasons for their faith, and shown why evolution is not true, have a much higher ‘Christian survival rate’. You see, when young people are ‘tossed to and fro’ in a culture that is permeated with every type of evil—because of their sin nature (Romans 5; Psalms 51), without a foundation of being trained in truth and knowing what they believe, they will most likely choose that which is wrong rather than that which is right. From our experience, we have over the years received many sad letters from people whose lives were all but destroyed because they were taught to compromise the Word of God, particularly in Genesis. What can happen when our children are trained in the truth of the Scriptures, and know what to believe? The following speaks for itself. A mother wrote to me with a testimony concerning her nine-year-old son Joe, who had just attended our creation family camp with his family. Joe is a real ‘Vegemite®© kid’! We need more ‘Joes’ who are trained according to God’ promises! 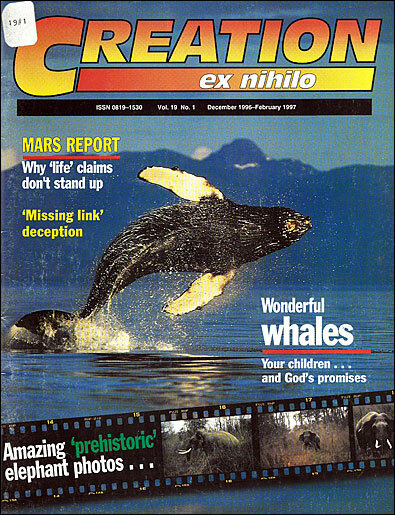 ‘Fathers, faith and fossils’, New Man, July–August 1996, p. 54.